Self-discipline can sometimes be a difficult habit to implement. We have too many conflicting habits already in place. So, how do we develop self-discipline? More importantly, what does it take to develop and hone lasting self-discipline to become successful? Below you'll learn why we do some of the things we do and a few specifics for changing poor habits into successful ones. In 1972 Walter Mischel, a psychologist, conducted a series of studies with children that have become known as the Marshmallow Studies. In the studies children were given a choice. They were told that the researcher was going to leave the room for a bit, and they could eat one marshmallow immediately, but if they could wait for 15 minutes, they would be rewarded with two. As you might expect, young children had a hard time waiting. One-third of them ate the marshmallow right away, one-third of them waited for a few minutes but then succumbed to the temptation, and the final third waited until he came back and were rewarded with two. The results of the study were then shelved for many years until something serendipitous happened. Mischel’s five-year-old daughter was part of the study as were many of her friends. Mischel noticed that there seemed to be clear correlations between how much self-discipline children had at five or six years old and how they developed as teens and adults. Funny enough, the kids who gobbled up their marshmallows were the same ones who got into trouble as teens. He decided to look back at the data and conduct further analysis. The findings were startling. It turns out that there are two major contributors to overall success: intelligence and self-discipline. While it’s incredibly difficult to alter intelligence, self-discipline is another story altogether. It’s entirely possible to improve your self-discipline. Not only that, as I found out in my doctoral research, self-discipline is probably the most important trait a poker player can possess. For our purposes, I’d like to define self-discipline as how closely your behavior at the table and away from it reflects the type of player and person you want to be. Self-discipline is a long-term proposition. Contrast this with willpower which is the ability to perform an action in spite of a negative emotional state. When you use willpower, you basically force yourself to to do something you don’t want to do. In the short run relying on willpower can work, but it’s a taxing process that won’t work over the long haul. Successful poker players must exhibit self-discipline continuously. From bankroll management, to game selection, to in-the-moment game decisions, self-discipline is required. Lose it for even just a moment and you can easily go busto! So how does one go about increasing self-discipline? It’s really as simple as developing a series of positive habits. When something is a habit, it no longer requires the mental energy of willpower. It’s as though you’re on autopilot. To really lose weight and keep it off, the best strategy is to build lifelong healthy habits. If you have a habit of going to the gym every morning no matter what, it’s very likely that you’ll lose weight. Sure, you might have to force yourself to the gym when you are just getting started, but eventually it becomes a part of you. The end result is that you’ll manage your weight without expending too much mental energy. Set a clearly defined goal. You must set goals for the poker habits you’d like to develop. Effective goals should be measurable and quantifiable. Consider what outcomes you want and create habits around them in a way that you can measure. Monitor your behavior. Many of us set goals, but how many of us monitor and keep track of our progress on a regular basis? Unfortunately, not many of us! What gets tracked is what gets improved upon. For example, you could keep a poker journal where you log your accomplishments or track your success rates with various hands from various positions. There are countless ways to track your behavior. The important thing is to pick something you will stick to. Be accountable. It’s easy to lie to ourselves, but lying to someone else is another matter entirely. Find some way to be accountable for achieving the new positive habits you’re implementing. You could get a coach or tell a trusted friend about your plans. Have daily or weekly check-ins where you discuss your progress and make any necessary tweaks. Habitual positive poker behaviors no longer require us to grit our teeth and rely on willpower once they have become ingrained. If you want to increase your self-discipline in poker, ask yourself what goal you’d like to reach and then go a step further and decide what habits you must implement to make that goal achievable. Your mission is to create the circumstances which make your desires inevitable. And once you’ve followed these steps and improved your self-discipline, reward yourself... say, with a marshmallow. Or two. 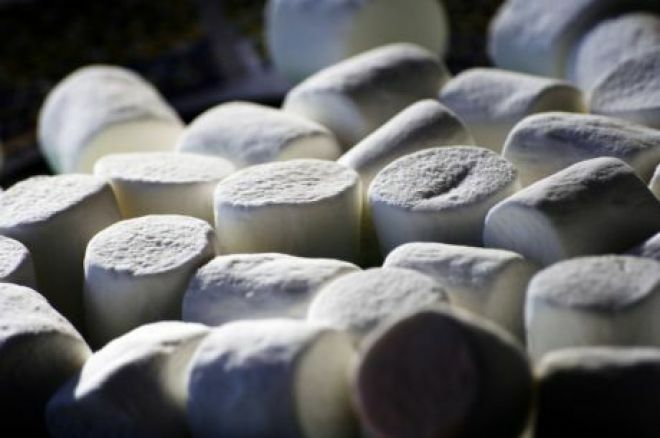 Photo: “Marshmallows,” John Morgan. Creative Commons Attribution ShareAlike 2.0 Generic.